← Did the Media Go Too Far? I love it when this happens. I have watched Secondhand Lions maybe half a dozen times. Some parts, probably well over a dozen times. And always there is the sense that some part of my mind is receiving some really meaningful signals. It is not, I regret to say, the part of my mind that recognizes and names patterns. Hub is such an appealing character and the scene is genuinely transformative for Walter, the confused little boy. And those things, among others, made me want to hear Hub differently than the way I was hearing him. In fact one of the major plot elements in the story is whether “all that Africa crap” really happened or not and that is the story I am telling today. I’ll start with an introduction to the movie. Then I’ll show you the scenes that make up this subplot. Finally, I’ll reflect little on what all that means. 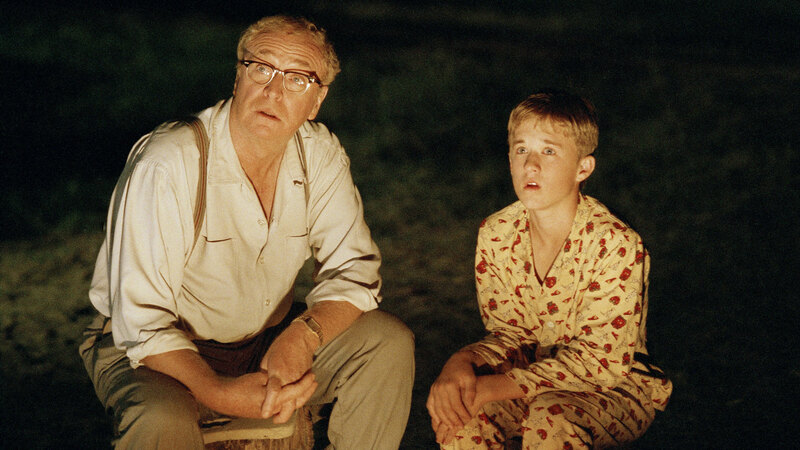 Walter,(Haley Joel Osment) a hapless pre-adolescent is dropped off by his irresponsible mother, Mae,(Krya Sedgwick) to spend the summer with his uncles, Garth (Michael Caine) and Hub (Robert Duval), neither of whom Walter knows. Garth and Hub are old men who live boldly in present day rural Indiana, but the stories they tell about their adventurous pasts are scarcely credible. Hub is the principal hero of the stories; Garth is the principal teller. Walter is drawn into the world of the stories because they are wonderful stories. First he rejects the whole idea that they happened at all. Then small fragments of the story come to seem plausible. Finally, Walter is living in the stories in the same way that Garth and Hub are. Late in the summer, Mae returns with a boyfriend, Stan. Stan is a bully and he is in debt to people who do extreme things to recover their money. Stan tries to get Walter to say where Garth and Hub’s legendary supply of money is. When Walter refuses, Stan punches him and promises a lot more punches if Walter doesn’t give in. That’s the origin of the “friends or enemies” remark. Walter and Uncle Garth are sitting on the porch watching Hub give his “what every boy needs to know about being a man” speech to a bunch of tough guys that Hub has just defeated in combat. Walter asks for more Africa stories. Uncle Garth:You don’t believe all this Africa stuff. Walter goes to stand with Uncle Hub in the middle of the night, looking over the lake. Garth has said that only Hub will tell Walter whatever happened to the legendary love of Hub’s life, the Princess Jasmine. Walter has come down to the lake to ask him. Walter:These stories about Africa…about you. They’re true, aren’t they? Walter:It does too. Around my mom, all I hear is lies. I don’t know what to believe in. Uncle Hub:If you want to believe in somethin’, then believe in it. Just because something isn’t true, that’s no reason you can’t believe in it. Sometimes the things that may or may not be true are the things a man needs to believe in the most. Doesn’t matter if it’s true or not. You see, a man should believe in those things because those are the things worth believing in. Mae and her thug boyfriend have returned, saying that Hub and Garth have all that money because they stole it from a bank back in the 1930s. Walter replies that they couldn’t have done that because they were in Africa in the 1930s. Walter:Hub and Garth didn’t rob any banks. They were in Africa. Mae:Africa! Oh Walter, be serious. Walter:They were shanghaied to the French Foreign Legion and had adventures for forty years. They couldn’t have robbed any banks. Stan: Oh come on pal, you don’t believe all that, do you? Mae:You? Mr. Doubting Thomas? Here Stan’s got actual evidence and you believe that Africa crap? Stan has taken Walter out to the barn, where he believes Garth and Hub’s money has been hidden. He is determined to scare the boy into telling him where it is. He punches Walter in the stomach, knocking the wind out of him. Then he lays out this proposition. Stan:So what’s it gonna be, pal. Friends? Or enemies? Movie Note: A full 11 seconds elapses between the question and the answer. During that 11 seconds, Walter’s face turns from passive fear to active joy and we hear, very faintly, the theme music of Garth and Hub’s Africa adventures. But in Uncle Hub’s fullest account of the value of the stories (Scene II), he says “believe in,” rather than “believe.” When Walter says he needs to know about the Africa stories, he says he has lived a life of being lied to and he doesn’t know what to believe—he doesn’t know, he means, “what is verifiably true.” That’s important to Walter because his mother, Mae, lies to him a lot. But Uncle Hub’s response has nothing at all to do with verifiability. “If you want to believe in something,” he says, “then believe in it.” Hub is talking about asserting the supreme value of what makes life good, things like honor, courage, and virtue. This has always been the tension of Christianity as a historical religion. We maintain that an event actually occurred. We maintain that the event is the basis of our commitment to the values that the event displays. 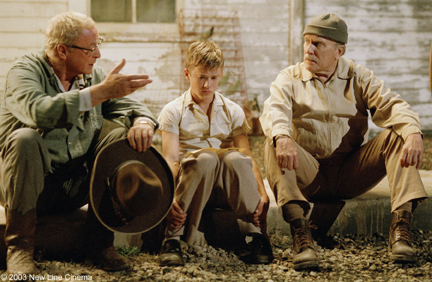 The charm of Secondhand Lions is that Walter moves from asking the “what is true” question to committing himself to the “what is right” question over the course of the film. So Walter’s response in Scene I indicates only that he finds Uncle Garth’s stories interesting in a time when he has nothing else to do. By Scene II, he wants to know whether Uncle Hub’s adventures actually happened—whether they are historically verifiable in principle. Uncle Hub’s response sweeps past the question of “believing that an event really occurred” and doesn’t stop until it gets to “values that are worth our commitment.” These things are worth “believing in.” These are things Walter can choose to believe in, regardless of how unreliable his mother is; regardless of how much he has come to clutch empirical certainty as a solution. Certainty is not a solution; commitment to ultimate values is the solution and we are free to commit ourselves to them just be choosing to. In fact, as Stan will find out in Scene IV, no one can stop us. So, in order: you can believe in it even if it is not true at the level of historical occurrence. Then, this is particularly true of the most important things. It is the most important things about which we must say that “they may or may not be true.” And finally, it is the values themselves that contain worth. Our obligation to believe in them is only a recognition that they are worth believing in. Notice how far Walter has come from his conversation in Scene I with Uncle Garth. Walter asks for more of the Africa story. Uncle Garth says, “You don’t believe all this Africa stuff.” This is the “believe” form; it means, you don’t believe these events actually occurred. It means, oddly, the same thing Mae means by “believe in.” Walter doesn’t answer the question. He asks for the stories on the ground that they are good stories, engaging stories. When Mae challenges him directly—You don’t believe in all this Africa crap…” —he answers directly, “Yes. I do.” And that answer is only moments away from his being punched by Stan and he is, in that way, asked the question much more directly. His answer to Stan, “Defend yourself!” is the same answer he gave his mother. Yes. I do. This solution—the transition from “good stories” to “Yes, I do believe them” looks so good on the screen that we are tempted, as Christians, to follow that same path. We would say, as Hub did, that values like honor, courage, and virtue or their Christian equivalents, are so True that they are worth believing in whether all that stuff about Jesus of Nazareth happened or not. I think that would be a mistake. ultimately worthy that they are worth “believing in” whether there ever was a Jesus or not. It has (almost) always been the position of the church that “when the time was right, God sent his Son.” The Son lived out obedience to God and exemplified the values that characterize God’s reign, but he came in history. The church “believes” that he came and we “believe in” the values—God’s values—which he showed and for which he was willing to die. Also…in Secondhand Lions, there is what amounts to a post-resurrection scene. The director showed good judgment in removing it from the theater version of the film. It is too long and complicated. Thank God he left it on the DVD. It relies on Josh Lucas—a face we scarcely see in the movie—as the adult Walter to bring off the final confirmatory scene. And it really doesn’t work as narrative. That people are basically good. Honor, courage and virtue? mean everything. That power and money, money and power, mean nothin’;. 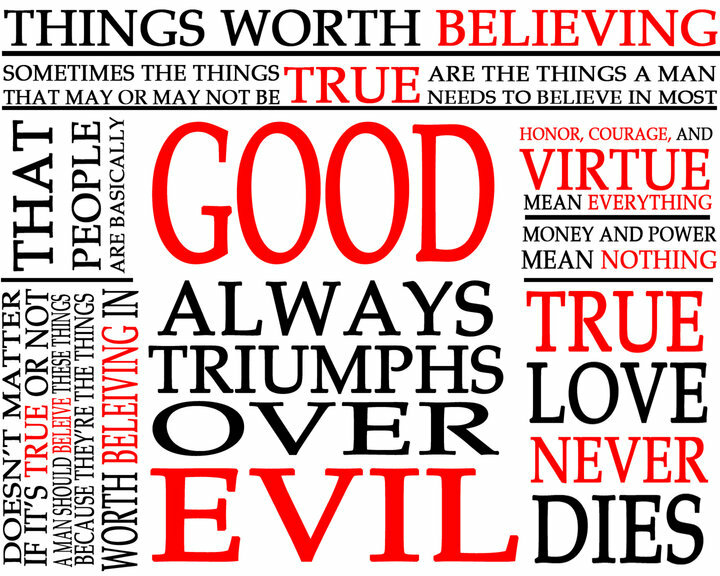 That good always triumphs over evil. And I want you to remember this. Love, true love, never dies. This entry was posted in Movies, Theology, ways of knowing and tagged believing in what is good, believing what is true, history and faith, Secondhand Lions. Bookmark the permalink.